If Matteo Renzi’s victory yesterday in the leadership contest for Italy’s center-left Partido Democratico (Democratic Party) was widely expected, what happens next is anything but clear. Though Renzi, the popular 38-year-old mayor of Florence, campaigned (unsuccessfully) to be the prime ministerial candidate of the broad centrosinistra (center-left) coalition just over a year ago on a platform of sweeping generational change within both the Italian left and right, he’s emerged today to a new landscape. Instead, Italy is governed today by two relatively young politicians — prime minister Enrico Letta (age 47) and deputy prime minister Angelino Alfano (age 43). The Democratic Party’s previous leader, the colorless Pier Luigi Bersani, stepped down after internal revolts against his preferred choice for Italy’s president (ultimately, Italy’s center-right and center-left coalesced around a second term for the incumbent, Giorgio Napolitano). The dominant figure of the Italian right for the past two decades, Silvio Berlusconi, was evicted late last month from the Italian Senato (Senate) in connection with his tax fraud conviction, and Alfano and the other center-right ministers in the current coalition government refused to join Berlusconi’s newly rechristened Forza Italia, forming their own alternative Nuovo Centrodestra (New Center-Right). That’s taken some of the wind out of Renzi’s populist ‘pox-on-both-your-houses’ message, which shares more than a little in common with that of Beppe Grillo’s anti-austerity protest group, the Movimento 5 Stelle (M5S, the Five Star Movement). In essence, Renzi’s victory means that the Italian left now has two leaders — Letta, who leads the coalition government, and Renzi, who will lead the party. 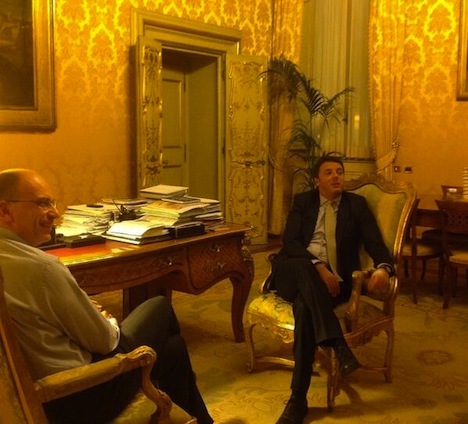 Renzi won’t join Letta’s cabinet, but the two have pledged to work together, even though Renzi often pledged during the leadership contest to push Letta harder to produce tangible reform legislation. What’s most clear is that the Letta-Renzi rivalry will now become one of the most central dynamics of Italian politics — more so than the recent split between Berlusconi and Alfano on the Italian right. In many ways, Renzi is becoming for the Italian left what Berlusconi has now become to the Italian right — a key leadership figure who is sufficiently removed from the current coalition government that he can run against the Letta government in the next elections. Although Berlusconi formally pulled out of the coalition while Renzi, ostensibly, still supports Letta’s government, both Berlusconi and Renzi (whose populism has caused more than a few comparisons to Berlusconi) will exert significant pressure on Italy’s government from the outside. Renzi won 68% of the Democratic Party leadership contest on Sunday, defeating both Gianni Cuperlo (18%) and Giuseppe Civati (14%). Cuperlo, a member of Italy’s Camera dei Deputati (Chamber of Deputies) whose background lies within the socialist/communist tradition of the Italian left, not the Christian democratic tradition, had the support of Bersani, former prime minister and foreign minister Massimo D’Alema, environmental minister Andrea Orlando, economic development minister Flavio Zanonato and Tuscan regional president Enrico Rossi — a particularly important endorsement, given that Florence is the largest city in Tuscany. 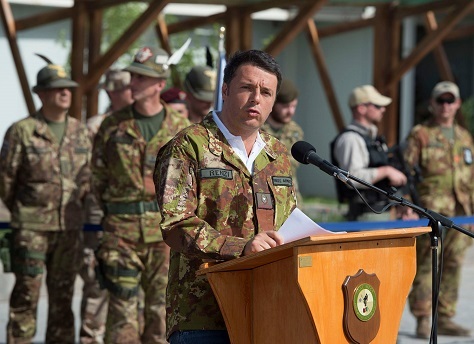 Ultimately, however, it wasn’t enough to stop Renzi, who routinely tops polls as Italy’s most popular politician. Over 2.5 million party members voted in the election, bolstering Renzi’s claim that he can mobilize broad support for the Democratic Party in advance of Italy’s next elections. Letta’s incentive is to hold onto power as long as possible in order to enact the kind of economic and labor market reforms that could unlock growth in the depressed Italian economy and make Italian exports more competitive globally, and to enact a new election law following the Italian constitutional court’s ruling last week that the current unwieldy law is unconstitutional. If Letta continues as prime minister through 2015 and manages to achieve some success, there’s always a chance that Letta could emerge as the centrosinistra‘s standard-bearer — Letta will have demonstrated that his government has accomplished the change that Renzi has only been able to promise. Renzi’s incentive is for Letta’s unwieldy coalition to hold on just long enough to unite Democratic Party behind Renzi’s leadership, presumably boost the centrosinistra‘s poll numbers, pass a new electoral law, and then head into elections relatively soon if Letta’s coalition fails (as is expected) to enact economic reforms. The longer it takes for a new election, the more likely it will be that Renzi’s star will fade as he becomes more associated with the Letta government — if the Letta government fails, Renzi risks being tainted with it by association; if the Letta government succeeds, Letta himself will obviously want to become the prime ministerial candidate. While it’s generally assumed today that Renzi — and not Letta — will lead the centrosinistra into the next Italian elections, Renzi has many enemies within the Democratic Party, including Bersani, D’Alema and much of the old guard who resent Renzi’s attacks on their leadership, as well as union leaders and other old-left stalwarts who fear that Renzi is a liberal ‘third way’ reformist in the mould of former US president Bill Clinton and former UK prime minister Tony Blair. Renzi, who is more popular with the wider electorate than within the centrosinistra, has called for lower taxes and a more comprehensive approach to economic reform.